Over the past couple of weeks or so, more and more players have been complaining about being permanently banned from the Call of Duty Ghosts Multiplayer Servers. The majority of the bans apparently have been against PS3 and PS4 users. Although most feel that the majority of the bans were well-deserved, a good amount of users are claiming that they have mistakenly been banned and are seeking of ways to have the bans lifted. One other of the many examples of possible unjust-ban claims comes from a Reddit user known as "wuzzup." He explains, "I too, have been permanently banned. I play maybe a couple hours/week and have never done anything against the code of conduct." Although there are a good amount of people with all of their own stories explaining their supposed innocence to Activision, their support team replies to a good amount of users in outright rejection. On a lighter note, some people have apparently been having their console & game perma-bans taken away. 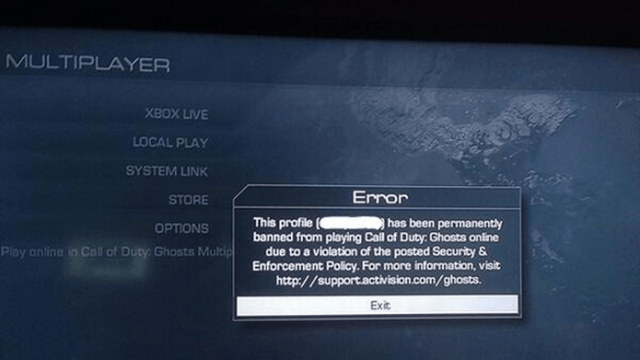 One user known as "themidnightsociety" informs the public, “it seems as if someone has been listening to us because I just checked my account on COD Ghosts and my permanent ban and console ban has been lifted and everything is back to how it was before the ban.” Perhaps then, Activision is not as heartless as some may see it to be. One can only imagine how it is probably difficult for Activision to call out who was in a modded lobby intentionally. Evidently, Activision is probably taking at least some shots in the dark with their banning. To be fair, it is more likely than not that some people who have been justly banned will be able to get out of it if they are clever enough with their messages to Activision support. With all of that being said, my fellow Sinners, all I can say is be careful when playing for a little while. Over the past week, both the Xbox One and the PlayStation 4 have received security updates for CoD: Ghosts in order to facilitate cracking down on cheaters like the lot of us are. If you are not a cheater and play CoD: Ghosts legitimately, you should have no problems, but be aware that Activision is not perfect and can make mistakes. Going one step further, if you are sort of somewhere in the middle of the spectrum, I included a link below to the aforementioned petition regarding the transparency of Activision's banning practices. If you have been perma-banned and believe it was wrongly done (or if you deserved and want to try your luck), try to contact Activision and possibly make your case. All in all, I leave you with an old quote, "Se7ensins.com, the reason why you need to update."